SANTIAGO, Jan 21 2014 (IPS) - A hydroelectric project under construction near the Chilean capital poses a threat to the supply of drinking water to more than six million people living in the Santiago Metropolitan Region. The Alto Maipo hydropower facility will consist of two run-of-the-river hydroelectric plants with a total capacity of 531 megawatts (MW), contributing an annual average of 2,465 gigawatt hours (GWh) to the Chilean grid. To generate this energy, the power station will harness water from the Volcán, Yeso and Colorado rivers, which are major tributaries of the Maipo river. The Maipo basin is rich in biodiversity and provides more than 60 percent of the potable water for the central Metropolitan Region, where Santiago is located. The Alto Maipo project is owned by two Chilean companies: AES Gener, which has a 60 percent stake, and Antofagasta Minerals (40 percent), which in turn is owned by Grupo Luksic, Chile’s wealthiest firm. Environmental groups view this partnership as proof that the goal of the project is to supply big, energy-hungry mining concerns in the north of the country, not the general population. The Maipo river flows through a canyon of the same name in the Andean mountains, 46 kilometres from Santiago. Its basin is forested with peumo (Cryptocarya alba), litre (Lithraea caustica) and soap bark trees (Quillaja saponaria) which harbour wildlife including pumas (mountain lions), foxes and Andean condors. “The Maipo river basin is overexploited by users of the Maipo canyon rivers, among them AES Gener, which has four hydropower stations in the area,” Marcela Mella, the spokeswoman for Coordinadora Ríos del Maipo (Maipo Rivers Coordinating Committee), told IPS. “In developed countries, all the river basins that supply drinking water to capital cities and other demographically important cities are protected,” she said. Forty percent of Chile’s 17 million people live in Santiago. According to environmental experts, there is a serious risk that this city will be left short of drinking water under certain circumstances. 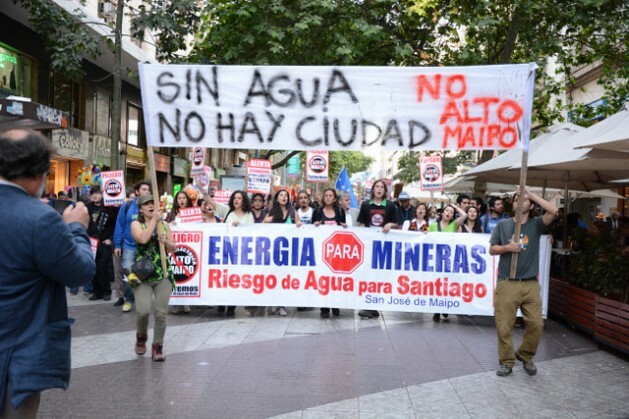 Roberto Román, an academic specialising in renewable energies at the University of Chile, told IPS that if Alto Maipo mismanages the system “there could be negative effects” on water supply to the capital. A real risk is posed by the agreement between AES Gener and Aguas Andinas, the main supplier of drinking water to the capital, for using the metropolitan region’s water reserves to generate electricity. Román said the danger of creating a shortage was “not just hypothetical” as it had already happened in the late 1990s, when Endesa, now a subsidiary of the Italian utility company Enel, built a gas-fired power station near Quintero, 180 kilometres north of Santiago. “The project experienced delays, and as (Endesa) was under contract to supply energy, it simply used up the reserves in Laguna del Laja (Laja Lake, the country’s largest natural reservoir), betting on normal rainfall in the (southern hemisphere) autumn of that year,” Román said. But 1998 was a very dry year and Endesa was unable to generate energy. Consequently, there were power outages all over the country, at first sporadically and later according to schedules. The website for AES Gener’s Alto Maipo project states that the water it uses will all be returned to the river Maipo, five kilometres upstream from the drinking water company (Aguas Andinas) inlet pipe, so that the power plant will not affect water supply to Santiago nor irrigation and recreational uses of the Maipo river. The hydropower plant will become operational in 2018 at a cost of over two billion dollars. Since its turbines will be activated by the “run-of-the-river” system, no dams will be needed. According to official information, the energy produced will feed into the Central Interconnected System, the grid that distributes electricity to almost all of the country. Román said that water resources in the Maipo canyon are fragile. “In several parts there is no drinking water and they depend on networks of pipes fed by small streams or springs,” he said. “There are also a great many ‘de facto’ uses of water that have been very difficult to establish as real rights,” he said. He was referring to the 1981 Water Code, introduced by the Augusto Pinochet dictatorship (1973-1990), which essentially privatised water and gave the state powers to grant water rights to prívate entities for free and in perpetuity. Water rights may be bought, sold or rented without regard to user priorities. “While in theory the Alto Maipo project will not affect water supply in the Maipo canyon, in practice it could exacerbate an already precarious situation,” Román said. At present local people in the Maipo basin are divided about the development of the project. “One sector, made up mainly of those who work or have their livelihood outside the canyon, generally oppose it. But there is also a sector, especially those with more uncertain and variable incomes, who see it as a source of direct or indirect job opportunities,” the expert said. Adolfo Astorga, president of the San José de Maipo Neighbourhood Council, often takes a stroll in the town square, which is unprepossessing although the area draws many tourists. In his dual role as citizen and local leader, Astorga takes a divided position with respect to the project. “Personally, I’m not in favor of it, because the benefits to us will be minimal compared to the impact of the project,” he told IPS. However, he said he supports the local people who are in favour of Alto Maipo and he understands them because it will bring job opportunities, “but not for long,” he warned. In Marcela Mella’s view, arguments for opposition to the project are mounting because, in addition to the risk of destruction of biodiversity and to water security, “there is a possibility in the short term of desertification of more than 100,000 hectares of the Maipo basin,” due to the construction of the two power plants and a 70-km water tunnel. For now, only a few hundred protestors are trying to put a stop to the quiet progress of Alto Maipo, and their demonstrations attract little publicity while the company has plenty of communications resources. Meanwhile, the people of Santiago seem unaware of the threat.